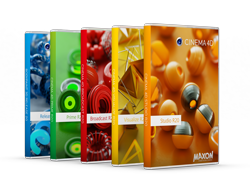 MAXON unveiled Cinema 4D Release 20, a break-through version of its 3D design and animation software. The new version introduces high-end features for visual effects and motion graphics artists -node-based materials, volume modeling, robust CAD import, dramatic evolution of the MoGraph toolset and much more. MAXON will debut Cinema 4D R20 live and online www.c4dlive.com at the upcoming SIGGRAPH 2018. MoGraph Fields – New capabilities in this industry-leading procedural animation toolset offer an entirely new way to define the strength of effects by combining falloffs - from simple shapes to shaders or sounds and objects and formulas. Artists can layer Fields with standard mixing modes and remap their effects. Group multiple Fields and use them to control effectors, deformers, weights, and more. Volume-based Modeling – Create complex models by adding or subtracting basic shapes in Boolean-type operations using Cinema 4D R20’s OpenVDB–based Volume Builder and Mesher. Procedurally build organic or hard-surface volumes using any Cinema 4D object including new Field objects. Volumes can be exported in sequenced .vdb format for use in any application or render engine that supports OpenVDB.